• The special 45° orientation of the double hinge increases the surface of the blade during the stroke and acts as an energy accumulator. • The central deformable part of the fin allows the blade to accumulate a volume of water that is determined by, and proportional to, the effort produced by the diver. On returning to its original form, this mass of water is forced to the rear in line with the fin by the central membrane (shape-memory material). • The Aquabionic fin thus outputs all the energy accumulated to deliver an effective thrust that considerably multiplies the initial effort made by the diver. 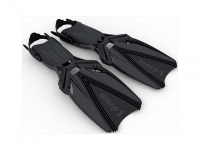 • The design of the Aquabionic eliminates lateral spill by producing a directional thrust in line with the blade, making this the perfect multi-purpose fin. - An excellent fin not only for the traditional scissors kick, but also ultra-efficient for frog kick or reverse finstrokes etc. • By amplifying displacement velocity (or thrust) with less fin effort, WARP technology reduces air-consumption and hence the diver’s energy expenditure. This Product was added to our catalogue on Tuesday, 20. February 2018.